I am so sick of hearing about Zappos in the blog-o-sphere. 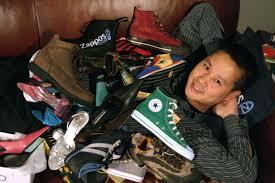 You know Zappos, the online shoe company that’s famous for delivering great customer service–or so we hear. One of the ‘7 Slight Edges’ is faith. I’ve written in the past that an important part of faith and helping you to keep faith, is measurement. We have to set a target of great service and use units of measurements to help us know we are on track—this helps us keep the faith. Now I want to cover another aspect of faith. Here is a common situation I’ve seen many times over my 26 years of experience—companies will tell me they want to be ‘known’ for delivering the best in customer service. They want to have the ‘reputation’ for providing great service. They want to be ‘top of mind’ in customer service. But then it seems that these companies will then hide away the fact that want to deliver great service. They may put it in their mission statement, include it in their marketing pieces and even invest in a training program but that’s about it. Companies that deliver great service amplify their faith—they shout service out loud so all their customers hear it. We need to amplify our faith—we need to have posters and signage in our hallways and in our lobbies that declare our commitment to service. Wherever our customers gather there needs to be reminders of the level service we want to provide. We need to amplify our faith–put our love of service on all of our marketing materials. Have a declaration to service be included in our email signatures. We need to amplify our faith—we need rugs in high traffic areas of our offices with a service message written in them. Our uniforms, name badges, hats need to shout out our service message. We need to amplify our faith—themes for company cookouts, holiday parties and Friday pizzas need to center on service. We can never let an opportunity to announce our faith in service to pass us by. Companies that deliver great customer service have faith. Companies that live the ‘7 slight edges’ amplify their faith. Please like, share, comment and tweet this message.